Philadelphia Flyers head coach Dave Hakstol. VOORHEES, N.J. — This might be the most topsy-turvy season the Flyers have had in their 51 years. They had one stretch in which they went 0-5-5 – from Nov. 11 to Dec. 2 — and found themselves sitting in last place in the Metropolitan Division. Right after that, they won six straight. More recently, they went 10-0-2 from Feb. 4 to 26, a streak that propelled them to the top of their division, if only for a day. At the time, they had a 13-point edge over the Eastern Conference's ninth-place team and were 16 points ahead of the surging Florida Panthers. Now, the Flyers are mired in another rut – they're 1-6-1 over their last eight games and are just four points ahead of the ninth-place Panthers, the same team they held a 16-point lead on as recently as a few weeks ago. And, just as they were back in December, the signal fires in the distance are looming with a message: Fire head coach Dave Hakstol. 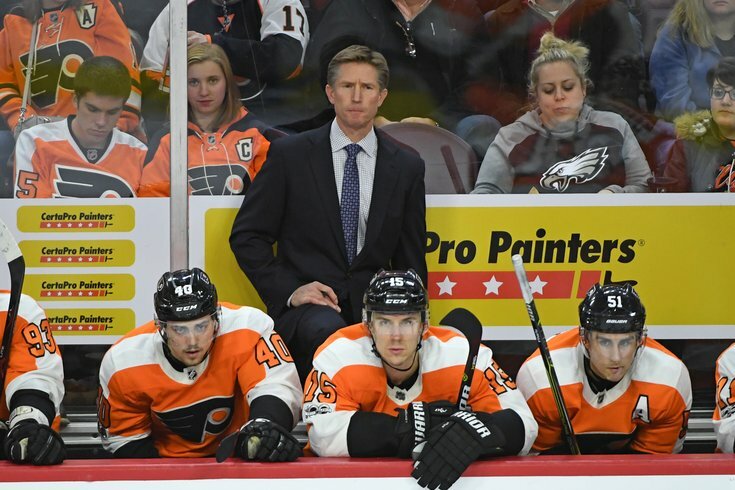 The reality is that, despite the growing noise around Hakstol, it's not going to happen this year – even if the Flyers fail to make the playoffs. For one, general manager Ron Hextall personally picked Hakstol to coach a team that is still forming. For Hextall to pull the plug on Hakstol now would be a self-inflicted indictment of himself. Plus, Morgan Frost is coming, and so is goalie sensation Carter Hart. Think of Hakstol as the hockey equivalent to 76ers’ coach Brett Brown, who has been given ample room as the Sixers were built. It appears Hakstol will be given that kind of time. Another strong point in Hakstol’s favor is that the players seem to believe in him. This roller coaster of a season has had one constant — and that’s been Hakstol’s steadying influence. He’s the one who moved Sean Couturier to the top line, with raging success. Switching Claude Giroux to left wing has reinvigorated the captain’s career. Hakstol has had to deal with a musical-chairs fiasco at goalie, splitting time with injured Brian Elliott and Michal Neuvirth, and being forced to use back-up Alex Lyon, who’s actually played quite well lately. “I don’t think I’ve ever gone through a season with this amount of ups and downs; you want to stay even-keeled throughout the year and I think our demeanor in the room has stayed that way, even though our play hasn’t indicated it,” Flyers’ defenseman Andrew MacDonald said. “Guys aren’t getting too down on themselves right now, and when we’re winning, guys aren’t getting too high on themselves, either. MacDonald knows the “white noise” is out there when it comes to Hakstol. But it’s a team that has been able to put the negative criticism aside. “We just go out and do our jobs,” MacDonald said. The Flyers are in third place in the Metropolitan Division, with 11 games left in the season, including two games this weekend: at Carolina on 7 p.m. Saturday and at home against Washington at 5 p.m. Sunday. “This is a team when everyone has stuck together,” Flyers’ forward Travis Konecny said. “Hakstol has kept us confident. He makes sure we know that we’re capable of getting wins when we need them and points when we need them. The whole coaching staff has stuck it out with us this whole time. We believe in Coach Hakstol, he’s someone we look to and someone we turn to. Hakstol's focus has kept a lid on the outside tremors. “My focus on my job and in this dressing room on what we’re trying to accomplish,” Hakstol said. “I’m trying to take care of the areas that we need to improve in and I’m sure we’re doing everything we can to be as ready as we can for what’s ahead. For now, that's this weekend's back-to-back against the Hurricanes and Capitals.